When the original Galaxy Note came out in the UK, it was met with a certain amount of skepticism from consumers. However, Samsung obviously knew what it was doing, as the device has gone on to sell really well. Fast forward a few months, and it's time for round 2: the Galaxy Note II comes with a bigger screen, a more comfortable aspect ratio, and it's available from today on Three. The cheapest monthly plan for the phone is £34 for the 'Ultimate Internet 500.' That gives you truly unlimited data, 5000 text messages, and 500 minutes every month. If you want more minutes, you can choose to opt for the One Plan instead, which will put you back £36 a month and bump you up to 2000 any network minutes and 5000 same network minutes. Both of these plans require an up-front cost of £69 for the phone itself. If you prefer, you can choose to go Pay As You Go for £499.99. As long as you top-up £15 every month, you'll get the same truly unlimited data package as you would in a contract, as well as 300 minutes and 3000 texts. 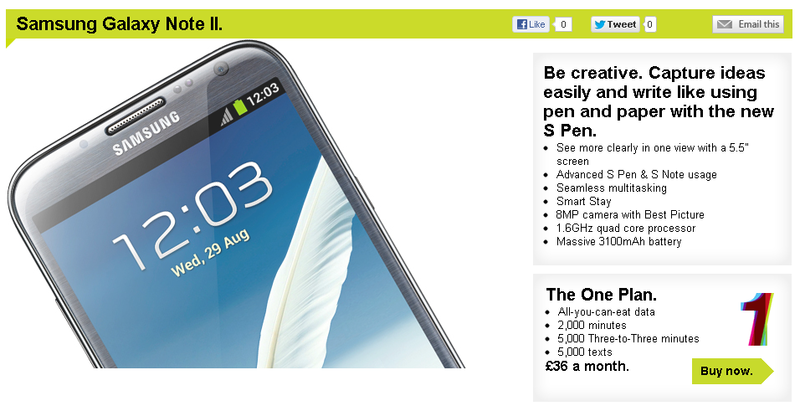 If you want to buy the Galaxy Note II, you can do so from today, either by visiting Three's website or going in-store.